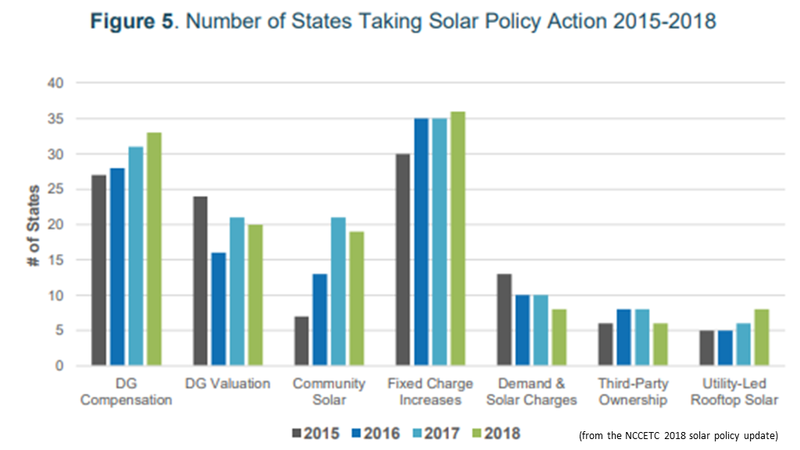 State and utility solar policies continued to undergo review in 2018, with nearly every state in the country considering policy or rate design changes – a trend which is likely to continue through 2019 and beyond. Table 1 provides a summary of state actions related to DG compensation, rate design, and solar ownership during 2018. Of the 264 actions cataloged, the most common were related to residential fixed charge and minimum bill increases (77), DG compensation policies (71), and community solar policies (39). The actions occurred across 47 states plus DC in 2018 (Figure 1). The states that saw the most solar policy action, or the most impactful actions, during 2018 are highlighted below. 1. Michigan The Michigan Public Service Commission approved a net metering successor tariff in 2018, which will move the state to an “inflow/outflow” compensation structure, with exported energy being credited at either the locational marginal price or power supply rate. The change is currently being implemented in DTE’s and UPPCO’s general rate cases, with the utilities both also proposing additional fees based on distributed generation system capacity. 2. South Carolina South Carolina legislators considered bills addressing the state’s aggregate cap on net metering and a successor tariff, although the proposals did not move forward. 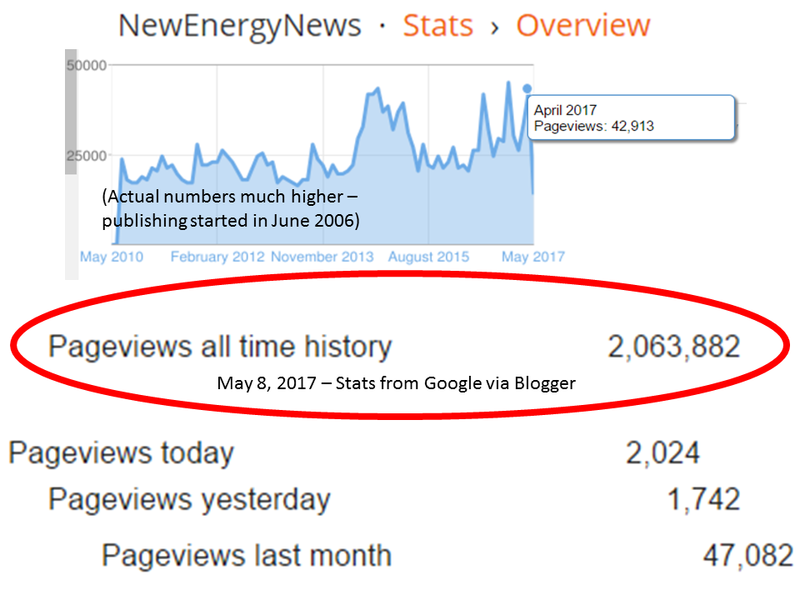 Later in the year, Duke Energy announced that it reached the aggregate cap and would be closing net metering to new customers. Duke Energy and stakeholders later reached an agreement that keeps net metering open until March 2019. Duke Energy Carolinas and Duke Energy Progress also filed general rate cases in 2018, with proposals to increase their residential fixed charges to $28.00 and $29.00. 3. New York The New York Public Service Commission continued to consider refinements to its Value of Distributed Energy Resources tariff and approved a “Hybrid Tariff” in late 2018 for solar facilities paired with energy storage. The Commission also considered options to increase low-income participation in the Community Distributed Generation program and approved a reduction in Central Hudson Gas & Electric’s residential fixed charge. 4. Massachusetts Massachusetts regulators approved the first mandatory demand charge for residential distributed generation customers of an investor-owned utility in early 2018. 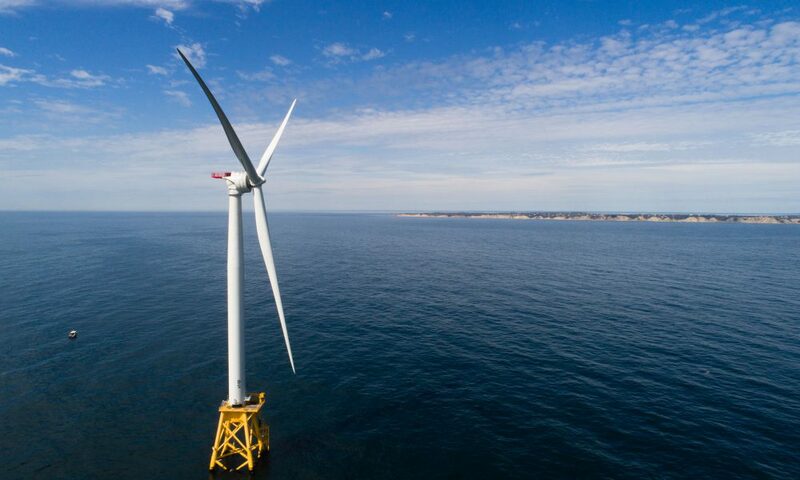 The charge was part of Eversource’s Monthly Minimum Reliability Contribution (MMRC). However, legislation enacted later in the year rendered the design of this demand charge no longer permissible. In November 2018, National Grid proposed an MMRC, with the charge taking the form of a fixed fee. 5. Arizona The Arizona Corporation Commission issued a decision on Tucson Electric Power’s and UNS Electric’s distributed generation rate design proposals in 2018, approving initial export rates of 9.64 cents per kWh and 11.5 cents per kWh, respectively, while rejecting the additional fees put forward by the utilities. Later in the year, Salt River Project proposed two new rate options for distributed solar customers, including one without a demand charge component. 6. 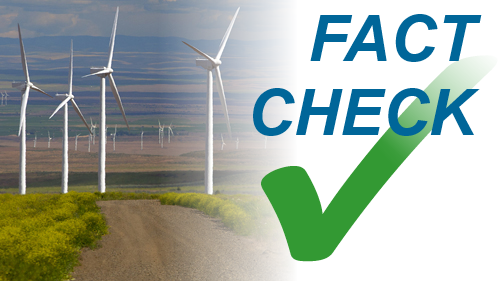 Connecticut The Connecticut General Assembly enacted legislation in 2018 creating a new shared clean energy program and requiring a transition to a net metering successor tariff, in addition to increasing the state’s renewable portfolio standard. The Public Utilities Regulatory Authority opened proceedings to implement the legislation and is also conducting a broad review of distribution system issues. 7. Maine Maine’s Governor vetoed proposed legislation making substantial changes to the state’s new solar compensation policy in 2018. The Public Utilities Commission approved significant changes to the policy, though, first amending the date of implementation and later addressing metering costs and restoring traditional net metering for medium and large non-residential customers. The Commission also considered general rate cases from Emera and Central Maine Power. 8. New Jersey In 2018, New Jersey became the 19th state to adopt a community solar policy with the enactment of A.B. 3723. The Board of Utilities worked to establish many of the program details throughout the remainder of the year. A.B. 3723 also increased the aggregate cap on net metering and enabled public entities to host remote net metering projects. The Board also considered general rate cases from Atlantic City Electric and PSE&G New Jersey. 9. Virginia Legislation enacted early in 2018 initiated a stakeholder process to consider changes to the state’s net metering and community solar programs, and the group’s facilitator published a final report later in the year. The Virginia General Assembly also considered legislation related to thirdparty power purchase agreements, and the State Corporation Commission approved net metering rule changes related to small agricultural generators and meter aggregation. 10. Montana NorthWestern Energy published its net metering cost-benefit study in 2018, finding a cost shift from net metering to non-net metering customers. Later in the year, NorthWestern Energy filed a general rate case, including a proposal to place residential net metering customers into a separate customer class and apply a demand charge to these customers. 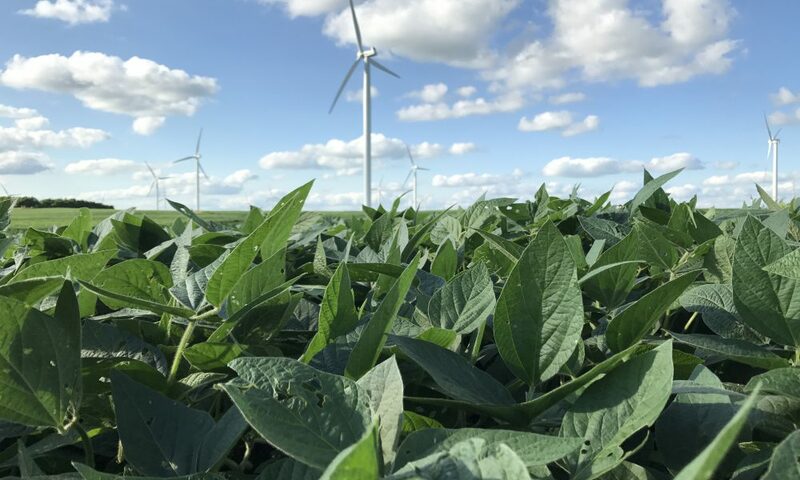 NorthWestern Energy also held a series of workshops throughout 2018 as part of its Customer Vision stakeholder process. 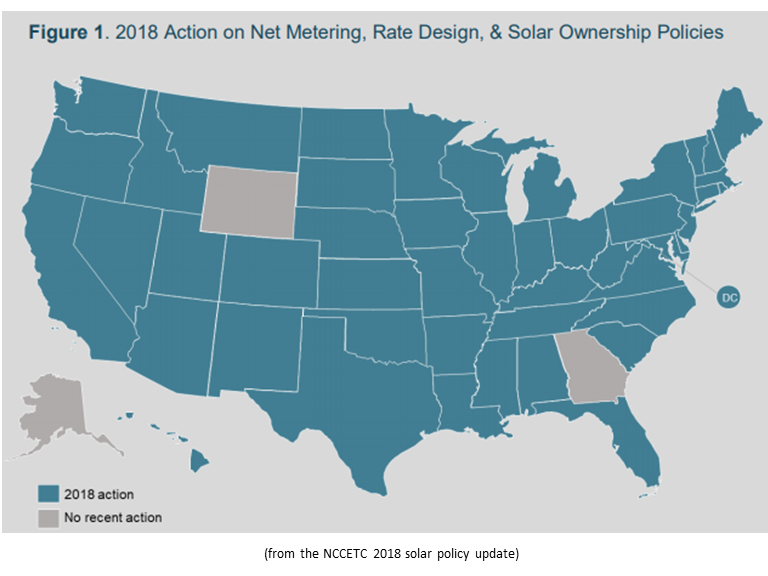 A record number of states considered net metering changes in 2018, with compensation structures becoming increasingly complex. Some programs feature separate rates for energy imports and exports, while others include time-varying rates, value-based rates, and locational components. Some community solar programs are also adopting more complex credit structures. Much of the community solar activity occurring in 2018 focused on expanding opportunities for low-income customers to participate in these programs. 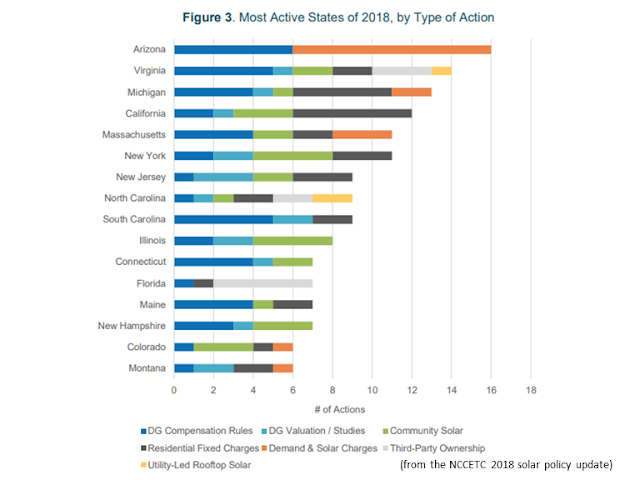 New community solar rules in Connecticut and New Jersey include provisions to encourage low-income participation, while states with existing programs, such as Colorado and New York, considered changes to increase the number of low-income subscribers. A growing number of states are considering the net metering eligibility of solar facilities paired with energy storage. In 2018, New York approved a tariff with multiple compensation options for systems paired with energy storage, and a proposed decision in California establishes equipment requirements for larger solar-plus-storage facilities to participate in net metering. Legislation enacted in Colorado also permits solar-plus-storage projects to net meter, and the Massachusetts Department of Public Utilities is currently considering the issue. Until 2018, investor-owned utilities’ requests to adopt mandatory demand charges for residential solar customers were continually denied. However, regulators approved three utilities’ (Kansas City Power & Light – KS, Westar Energy – KS, and Eversource – MA) residential demand charge proposals in 2018. The Massachusetts General Assembly enacted legislation creating new requirements for demand charges, though, effectively repealing Eversource’s charge. Although solar leases are commonly used in many states, the legal status of solar leasing is still unclear in some states. In 2018, solar companies filed petitions for declaratory rulings on the legality of their residential solar equipment leases in Florida and Wisconsin. The Florida Public Service Commission approved two companies’ leasing agreements, while a decision is pending in Wisconsin. Since 2016, the number of investor-owned and large public power utilities proposing residential fixed charge increases of at least 10% has steadily declined. 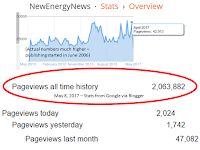 In 2016, 47 utilities filed such requests, while this number dropped to 41 in 2017 and 34 in 2018. The median increase requested has also decreased since 2016. Among proposals filed in 2016, the median requested increase was $4.07, while the median request was $4.00 in 2017 and $3.87 in 2018. States are increasingly taking a more holistic view to energy policy discussions, with several states considering solar policy issues as part of expansive grid modernization proceedings. For example, Arkansas, Colorado, Illinois, Maryland, and New York are considering distributed solar as part of their grid modernization efforts. Furthermore, states are often considering policies applicable to distributed energy resources more broadly, rather than considering solar exclusively. Several states and utilities are considering the option of placing distributed generation customers into a separate customer class. Regulators are reaching mixed decisions on this concept, though, with Idaho and Kansas regulators approving requests from Idaho Power and Kansas City Power & Light for a separate customer class, and the Iowa Utilities Board rejecting Interstate Power & Light’s proposal. The Michigan Public Service Commission also determined, in its April 2018 net metering decision, that a separate customer class was not warranted. Several states and utilities are creating multiple compensation and rate options for distributed solar customers to choose from. In Massachusetts, the new Alternative On-Bill Credit mechanism provides an alternative to net metering. In Arizona, Salt River Project proposed two new rate options for solar customers, including a demand charge free option. 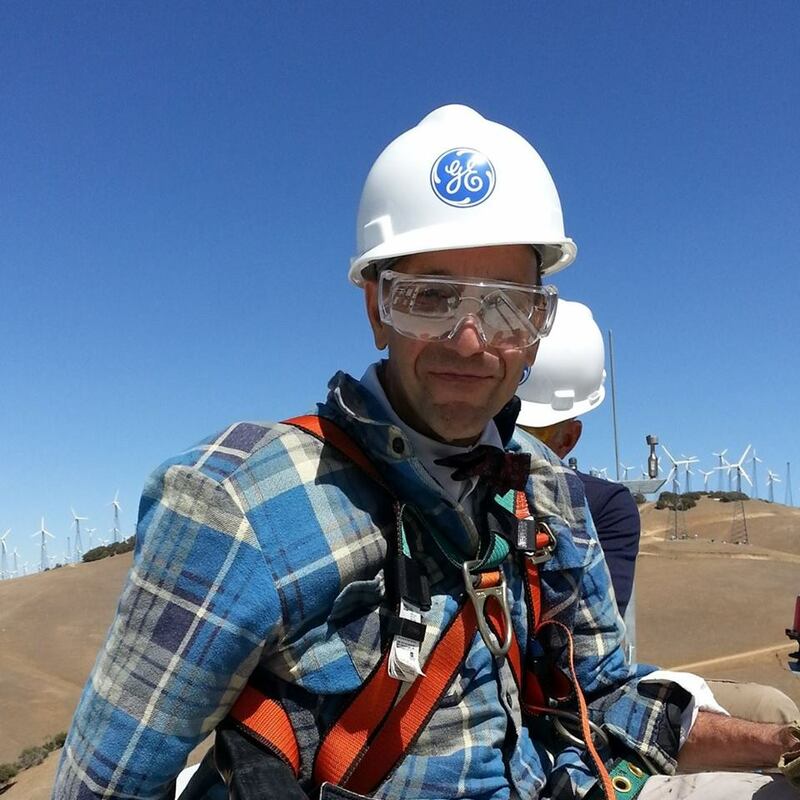 Arizona and Maryland are rolling out pilots featuring time-varying credit rates, and New York’s new hybrid tariff for facilities paired with storage includes four compensation options. In 2018, several states made efforts to determine the locational value of distributed generation, with the goal of eventually incorporating locational value into compensation frameworks. Regulators in Missouri, Nevada, and Washington considered distribution system planning rules addressing locational value, and the New Hampshire Public Utilities Commission decided to undertake a distribution-level locational value study. United Illuminating in Connecticut also rolled out a pilot program providing an adder for distributed resources on particular circuits. Distributed solar policy action has steadily increased over the past few years, with states and utilities taking approximately 175 actions in 2015, 212 actions in 2016, 249 actions in 2017, and 264 actions in 2018. Figure 4 shows the total number of solar policy actions taken in each year, by category, while Figure 5 displays the number of states taking action in each category. Note that several actions were considered over multiple years. In 2018, activity increased in most categories. There was a slight decline in proposals to increase residential fixed charges by at least 10%, while actions related to third-party ownership held constant from 2017. 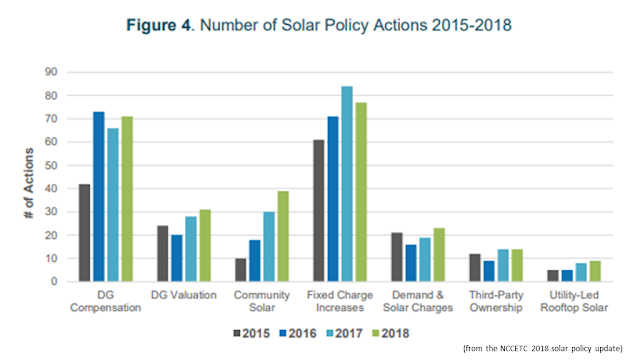 Community solar is the only category showing a consistent increase in actions from 2015 to 2018. Distributed generation compensation is the only category showing a consistent increase in the number of states taking action from 2015 to 2018, with consideration of net metering successor tariffs, in particular, spreading to new states. The number of states considering demand and solar charges declined in 2018, although the number of actions increased. This is largely attributable to the high number of proposals under consideration from three Arizona utilities, Tucson Electric Power, Salt River Project, and UNS Electric. Although the number of states where utilities proposed significant increases in residential fixed charges grew, the number of new proposals filed in 2018 declined from previous years. 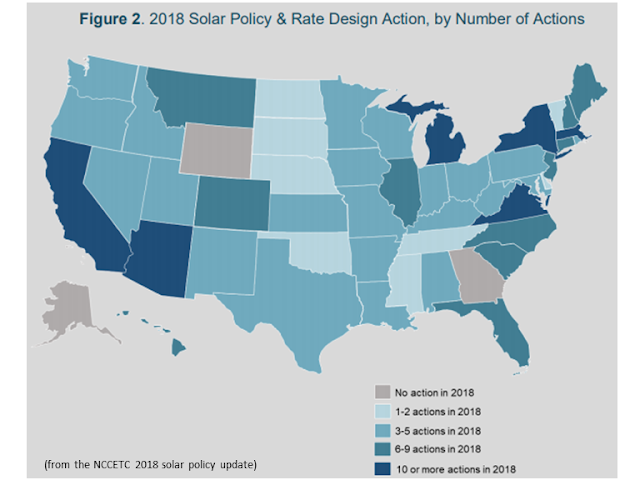 In the fourth quarter of 2018, 43 states plus DC took a total of 152 actions related to distributed solar policy and rate design (Figure 6). Table 2 provides a summary of state actions related to DG compensation, rate design, and solar ownership during Q4 2018. Of the 152 actions catalogued, the most common were related to residential fixed charge and minimum bill increases (41), followed by DG compensation rules (39), and community solar (29). In December 2018, the Maine Public Utilities Commission (PUC) exempted medium and large non-residential customer-generators from the gross metering provisions of the state’s new distributed generation compensation rules. The PUC found that the cost of installing a second meter to implement the gross metering provisions is not justified for these customers, due to the demand charge component of their bills. In December 2018, Sunrun filed a request for a declaratory ruling on the legality of its residential solar equipment lease. Currently, the legality of solar leasing and third-party power purchase agreements is unclear in Wisconsin. 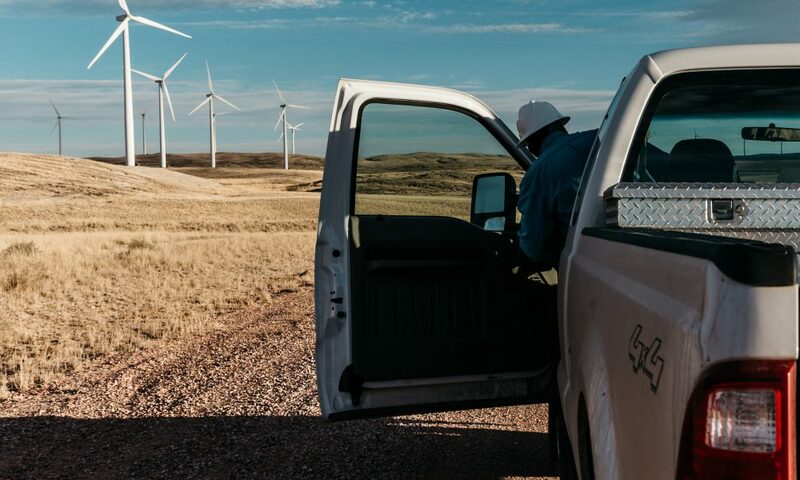 In 2017, the Public Service Commission determined that the issue of third-party power purchase agreements would be better addressed by the state legislature. 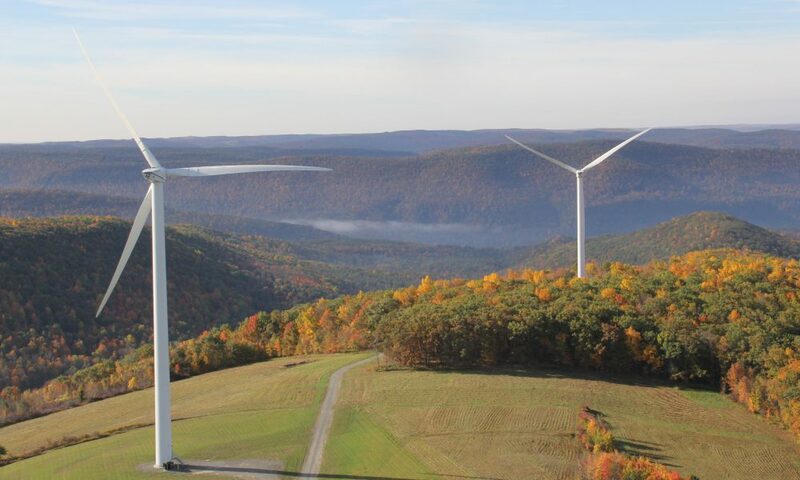 The New York Public Service Commission approved a new “Hybrid Tariff” for customers with value stack eligible generators that are paired with energy storage. The Hybrid Tariff includes four options based on different usage models and distinguishes between renewable and nonrenewable energy injected into the grid, so that renewable energy injections may receive compensation for environmental benefits. The Kansas Corporation Commission approved Kansas City Power & Light’s request to implement a mandatory demand charge of $9.00 per kW (summer) / $2.00 per kW (winter) for residential distributed generation customers in December 2018. This is the third mandatory residential solar customer demand charge approved in 2018, although Eversource’s charge has since been overturned by legislation enacted in August. Salt River Project, a large municipal utility in Arizona, proposed two new rate options for customergenerators in December 2018. Currently customer-generators are required to pay a demand charge based on maximum monthly demand during system peak hours. One of the new options includes a demand charge based on an average of daily demand, while the other option does not include a demand charge, but provides a reduced credit rate for energy delivered to the grid.